Simple Supper: Spaghetti with Shaved Asparagus & Lemony Breadcrumbs! / Hey, EEP! 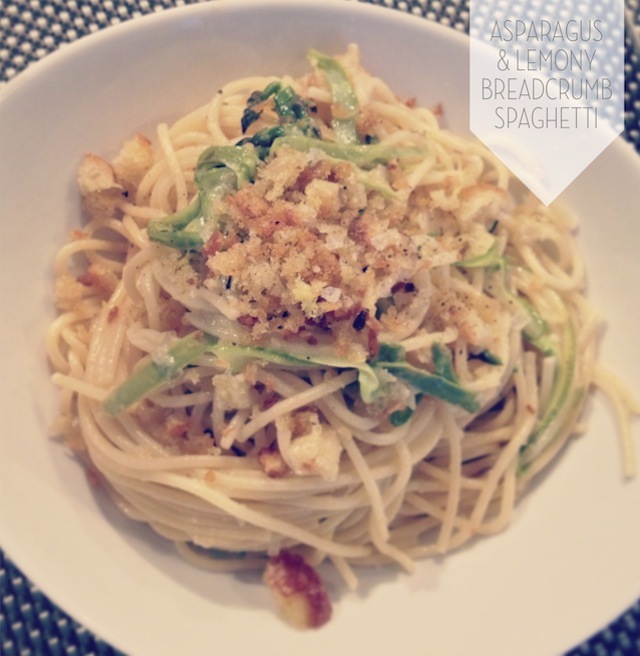 Simple Supper: Spaghetti with Shaved Asparagus & Lemony Breadcrumbs! 1. Bring salted water to a boil in a large saucepan. Add spaghetti and cook as label directs. Add asparagus to the boiling water 2 minutes before the pasta is done cooking; reserve 1/4 cup cooking water, then drain spaghetti and asparagus together. 2. Meanwhile, pulse the baguette, olive oil and 1/4 teaspoon salt in a food processor until coarsely ground. Transfer to a skillet and cook, shaking the pan occasionally, over medium heat until toasted, about 3 minutes. Transfer breadcrumbs to a small bowl, add the lemon zest and stir to combine; reserve the skillet. 3. To the same skillet, add the spaghetti, asparagus, butter and 1/2 cup parmesan cheese and cook, tossing, over medium heat until combined. Add cooking water, as needed, to loosen. Divide pasta among 4 bowls. Top with freshly ground pepper, the breadcrumbs and remaining 1/2 cup parmesan cheese.